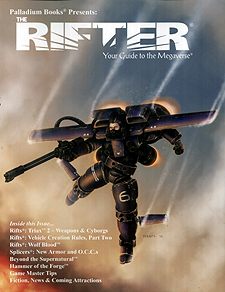 The Rifter Number 51 is a technophile's dream come true with page after page of high-tech weapons, equipment, cyborgs and vehicle construction rules for Rifts and symbiotic bio-armour for Splicers. Plus GM tips, material for Beyond the Supernatural, fiction, coming attractions and lots of news. The Rifter is your doorway to unlimited imagination and numerous Palladium role-playing worlds. It offers new heroes, powers, weapons, magic and adventure for your games. It presents new villains, monsters and dangers to battle, and new ideas to consider. And it helps you unlock your imagination by showing you what other gamers, just like you, have created. Rifts - "Official" weapons, mobile sentries, and cyborgs for Rifts Triax 2, written by Brandon Aten and Kevin Siembieda. Rifts - Vehicle Construction Rules, Part Two. Splicers - new OCCs, the Metamorph and the Swarm Lord. Beyond the Supernatural - game and character ideas. All settings - tips for handling young and beginner players. The latest chapter of The Hammer of the Forge - fiction.